I did my masters in International politics at Jawaharlal Nehru University, Delhi. My intention was to get into civils. But I am not the kind of person who stick to a defined domain and work under somebody. I am a frank person and I am never diplomatic about anything. I used to be an amateur photographer. I wanted to enter visual media after post-graduation. I wanted to get an job as copy writer in any advertising company. That is when I got myself introduced to Gangaraju Gunnam through a common friend. I worked for his movie ‘Little Soldiers’ in the direction department. After Little Soldiers got released, cinematographer Rasool Ellore introduced me to Krishna Vamsi. But Krishna Vamsi refused to take me in his team. I sat idle for an year and got an offer to work for a film titled ‘Santhi Santhi Santhi’ in Kannada. Actress Ramya Krishna was my friend and she was dating Krishna Vamsi at that time. She forced Krishna Vamsi to take me in his next project Chandralekha. Krishna Vamsi was a big task master and it was tough to work with him. It was so tough that I broke down one day. Then Krishna Vamsi told me that I had the potential and whatever he has put me through is to make me more stronger for the tough job of direction. I had become an integral part of Krishna Vamsi’s team from Chandralekha to Shakti (Hindi remake of Anthahpuram). It was during the shoot of Shakti, Krishna Vamsi has suggested that I should start looking at directing films independently. At that time, Karishma Kapoor was contemplating on doing the desi version of ‘My Best Friend’s Wedding’ and she asked me if I can write the script. I penned the script and she okayed it. She roped in Sonali Bendre to do another viral role. That is when we learnt that Yashraj Films was coming up with a remake of the same titled ‘Meri Yaar Ki Shaadi’. We had to drop that project. Shakti film was bombed at the box office and it didn’t help me to continue my association with Karishma further. Krishna Vamsi sent me to D Suresh Babu and I have worked for Suresh Productions for three years. I was supposed to direct a movie for Suresh Productions and things didn’t materialise for various reasons. 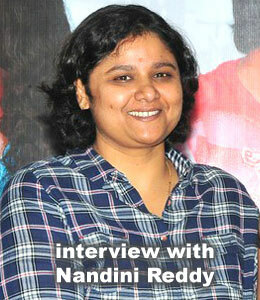 Telugu film industry is a male-dominated field. Was it difficult for women to take a career and pursue it in films? I had never thought about ‘female factor’ till I joined films. In the initial part of my career I was given the job of costumes/props/continuity. I feel that Telugu film industry is a fair industry and it’s up to us to grow. There is a lot of curiosity about ‘Ala Modalaindi’ in the industry because a lady is making her debut. Tell us about how Ala Modalaindi happened? Music director Kalyani Malik is a good friend. I narrated this subject to him and he liked it. He introduced me to Damu (producer KL Damodar Prasad). I wasn’t sure that this project was going to happen. But Damu liked it and made a decision to produce the movie right after listening to the first half. What is Ala Modalaindi story is all about? It is a film about destiny and journey of two people towards each other (it is not a travel movie). In this fast-paced life-style, love/relationships have become highly tentative. This film explores if there is a chance of true love and how destiny makes it happen. The screenplay structure of the movie is formulaic. But the writing is real-life like and completely natural. Nani is a very good friend. I have written this script by keeping Nani as hero. Cinematographer Om Prakash recommended us Nitya Menon and she is a perfect fit. Sneha Ullal and Kriti Karbandha are doing cameos which are vital to the story. I told Kalyani Malik that I need five songs of different flavor which could uniquely fit into the script. Kalyani’s forte has always been melody and freshness. But he didn’t get his due so far. He is a tough guy and we ended up having lots of arguments. I rejected lots of his tunes. He came up with quality tunes. All the songs are fresh and they go well with the flow. Ala Modalaindi is an ideal CD to tune in your car while driving along. My favorite song is ‘Innallaa’. Is this movie is inspired by ‘When Harry Met Sally’? Yes. There is a bit of inspiration from When Harry Met Sally. The destiny part and the inability of lead pair to express love. The total runtime of the movie is around 2 hours and 10 minutes. This film has obtained U certificate. It’s been a long journey for you to become a film director in this industry. How was it? It was a great ride and I loved the journey. I ave had a few bitter experiences. I cherish those bitter experiences because they taught me a lot and made me a stronger person. I want to explore different genres. Romcom (Romantic comedy) is something I love to watch and I am happy that I am making my debut with a romcom. I may do a thriller as my next project.